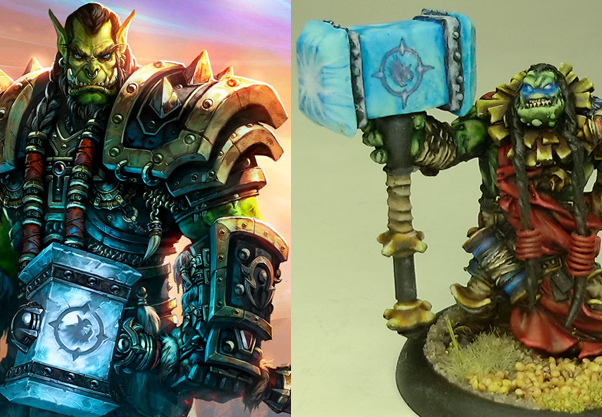 Wargaming Tradecraft: Madrak  Thrall Completed! After much work, I've finally completed Madrak / Thrall. In his final days, I got pretty into the work and didn't get nearly as many WIP shots as I would have liked. Because of this, I'll cover what I can before showing off the final photos. I wanted to have something that would stand out, so I used a nail jewel. Step the first was drilling an indent into the surface of his trinket. I put a small amount of green stuff in that gap and pushed the jewel in. This created a trim out of the green stuff dislocated. After varnishing, this jewel totally frosted. A little scraping with my knife later solved that. Just wanted to zoom out here and show some contrast. While I used non-metallic metals for most of him (aka, used browns and yellows to paint his armour's gold trim) I used some actual silver paint for the tiny loops on the strapping around his wrists. In the larger pictures take a look as well - just an example of how some subtle differences go a long way to adding to a model. You'll recall that after creating the first spearhead for an Impaler, I got an idea to create Thrall's hammer out of Turquoise. The first steps of the hammer, were pretty basic.. after finding stones large enough to use. After cutting the pieces into around the right shapes, I used a coarse (rough) grinding stone in a dremmel to grind the shapes carefully how I wanted them. Follow that up with a smoother grinding stone to polish the stone and add a shine. I ended up doing this a few times, as TheWife helped me realize the hammer was a liiiiittle too big and had to be shrunk what I could. Once the hammer was assembled, I layed a couple VERY THIN strips of green stuff around each side and glued tiny beads to it like bolts. Some Gesso to prime them (remind me to get black Gesso), then painted black, then highlighted strongly. 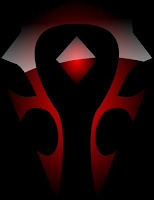 I also free-handed the Frostwolf Emblem on the facing side of his hammer. 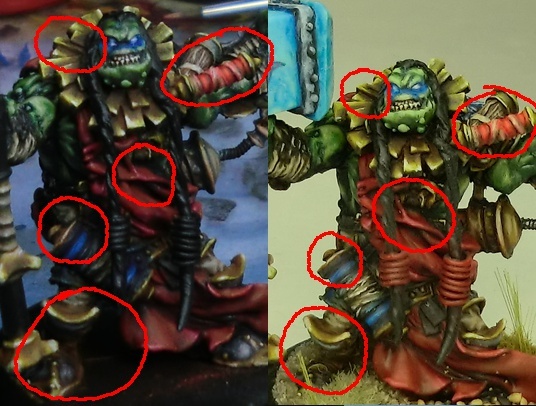 Between some blue pigment powder and the varnish, the tone of the stone hammer was reined in to match that of the model. For Madrak, because of the pigments I used, I was worried about painting on the varnish as usual. Instead, I used straight (un-diluted) varnish and airbrushed two light coats on. Look at the areas I've circled. Note how there's no loss of colour or quality, and how the pigmented areas (such as the dark brown on his gold) remain strong. Basing was as simple as some sand, strawberry seeds (the larger stones... found in the soap making section of Michaels hobby store), some static grass and larger face straw/grass. I used super glue to base. Very nice! Looks stunning. I know you weren't going for a replica look, but were you ever tempted to give him some pointy ears? To be honest, I did ponder it... just like whether or not to add hair. It came down to this: If I give him hair/ears, I have to give them all (mostly) hair / (always) ears. Ears are purely aesthetic and won't add anything to the models... while hair will add character. I love it. This is probably my favorite model I've seen you do. The entire composition is just fantastic. I'm reallllly looking forward to working on the rest of the army after seeing how he finally turned out. Wow, Dave, that's amazing! Truly beautiful work, I am just blown away with all the attention to details that you put into this. Fashioning the hammer out of a real piece of stone has got to be one of the craziest things I've seen done for a model. Fantastic! No doubt as you complete his buddies this will be one of the coolest armies out there.